The world through the eyes of children is a different one from that through the contaminated elder generation. They see the world with vibrant colours, exquisite imagination and vivacious details. No matter what the elders may say about their mental capability, these children understand many things between heaven and earth. And they have their own perspectives of these. “Who was I before I became a hard-headed old man with eyes that see everything with a grain of distrust?” the mind wonders. The International Children's Film Festival is an effort to see the world anew. The weeklong festival starting from January 22nd came to a grand conclusion on the 28th. Central Public Library Auditoriums, British Council Auditorium, German Culture Centre Auditorium, Russian Centre for Science and Culture and many other places enjoyed a great number of spectators enjoying the films for and by kids. “About 230 films were shown in the festival, among which 48 were made by children from Bangladesh in the Competition Group,” informs the Media Coordinator Sheikh Sazid. On the last day, a prize giving ceremony was held where the 5 best movies were awarded as well as the two best essays in an essay-writing competition. An impressive crest and a check of 25000 taka for their next project were handed to the best directors, the money being subjected to the submission of a script. The special prizes went to 'Nataier Sutay Gittu' and 'A+' while 'Shimanter Khoje', 'Blind Hope' and 'Tomrai Amra' got the 3rd, 2nd and 1st prizes respectively. It was a treat to watch their reactions upon hearing their names on the mike. One broke down in tears; one shrieked on the speaker and turned all the audience deaf for a few moments. They expressed their gratitude to all concerned and thanked Children's Film Society Bangladesh for their wonderful effort to bring out the latent talent of film-making in children. 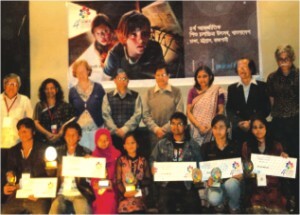 As the prize giving ceremony concluded, the awarded films were shown on the big screen. These kids know their stuff, thought I. The camera angles, blank shots, close-ups, use of perspectives and every other aspects of film making were expertly handled. Sometimes these make you wonder, if they really are made by some kids. I admit: there are certain aspects in the short films that might get them to be classified as failures. There are shaky starts, bad resolution in handicam, amateur acting and other things, but you have to remember these are the first attempts by kids no older than 18. Yet there are some fantastic camera work, moving dialogues, fascinating expressions and above all their representation of lives as they see it. With the motto “Future in Frames”, Morshedul Islam, the festival director promised the dates of the 5th International Film Festival as January 21st to 27th, 2012 in a much wider spectrum encompassing all the divisional centres of the country. Let's dream of an Oscar or a Golden Globe award for someone among these youngsters. On the 20th of January, Sunbeams took its extremely excited Class X batch on a study tour to Mymensingh to learn about BRAC, the biggest NGO in Bangladesh. 36 students, three teachers (chaperones), five staff members and two BRAC personnel in two buses. Calculation: 36 ÷ 3 = 12 students per chaperone, nothing short of desirable, obviously. The students were then taken to the paper making factory where they were shown how paper is made from jute (brown muck) and recycled paper. They tried to work the pressure machine used to press water out of the paper (and mostly failed drastically), chased chickens, tried on paper hats (or bowls), accidentally snorted a silkworm and disbelievingly laughed at the person who claimed to do so. Then they all went to TARC to eat and go to bed. At night, the guys watched The Exorcist, told scary ghost stories *cough*, screamed and stayed awake in perpetual fear. The girls watched movies, passed around junk food, were grossed out by Sadie-ness and brutal killings, and laughed at the guys. Everyone arrived downstairs, ate breakfast then packed into the two buses. On the way to where they were going, the students passed a large elephant and 'The Bulbul Circus'. This time, the entire batch was treated to a boat trip on the river. Titanic pictures were taken, pants were taken off… by the guys who were wearing shorts underneath and girls (Sadie's) were splashed. When one of the boats got stuck in the mud the guys on that boat even got down in their boxers (apparently) and pushed it off. They visited a church, rode the boat close to the Indian border and rode back to the dock. After a late lunch and a long bus ride, including the girl's bus getting stuck in a ditch in the dark, the students arrived in TARC again. After dinner, sleep ensued… not. The guys repeated the previous night's events and the girls danced, talked and watched different movies. As the trip came to an end, the students and teachers became more punctual. The morning of the last day, everyone packed and sent off their luggage. They were taken to one of the BRAC schools for Garo children, to see how they operate. The kids sang and danced and when the 'accomplished' students from Dhaka tried to join them, they were outperformed easily. The students were then allowed to talk to two women who had participated in BRAC's microfinance program. They told the students about how they had taken loans to start, develop and then expand their businesses. They answered the various questions the students had and then it was back to the bus. A quick stop at the local handicraft shop and another long bus ride found them back at the Centre for Development Management, lunching. A series of group 'goodbye' pictures followed and then yet another long bus ride (yes, history repeats itself and gets annoying while it's at it). 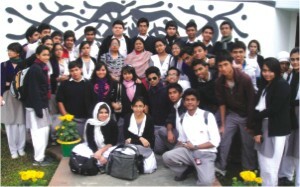 The students then found themselves at the Aarong Milk Factory in Savaar. There they were shown how milk is processed, from the arrival of the raw milk at the factory to the regulation of protein and fat content, to the packaging. The tour guide informed them of the various processes applied at each stage, including the production of yoghurt, butter etc. This time when everyone piled in, it was for the last time and the bus headed towards home. And then it passed almost everyone's homes and headed to Dhanmondi Rd 27. On the way, an expressive game of charades took place in the girl's bus (notable: Saving Private Ryan). Once the bus arrived, at 9 o' clock, everyone piled out for the last time. The trip was memorable, fever-conquering, informative and I still can't believe they let us do it. All thanks to BRAC, we learnt a lot. Dedicated to Jor, Sadie, Forget-U-Not, Royal Highness and ya'll. AWW.